Put down the iPads, iPods, cell phones and laptops (but not until you finish reading this post)and enjoy one of the oldest outdoor adventures together as a family! Trekaroo has put together a great list of some of the best whitewater rafting trips with kids. Whitewater river rafting is an adrenaline pumping extreme sport where you crash down rivers in an inflatable raft circumnavigating rocks and boulders and soaring through open bodies of rough white water. 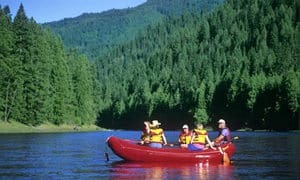 Luckily for families less likely to take on extreme trips, there are 6 different classes of rapids, making finding the right trip for your family easy. Class 1: Few, small areas of rough water with very little maneuvering, if any. (No experience necessary). Class 2: Some maneuvering through semi-rough water. (Good to know basic paddling). Class 3: You’ll maneuver through white water over small waves and maybe a small drop. (Should have experience paddling). Class 4: You’ll maneuver through white water over medium size waves, some rocks, and medium drops. (Previous white water experience is helpful). Class 5: Large rocky waves, huge volumes of water, rough rapids, big drops. (Must have white water experience). Class 6: Expert level! These rapids have everything previously mentioned and more. Chances of getting hurt are likely, so proceed with extreme caution! Most outfitters list age and skill level requirements for families wanting to experience rafting together. Many provide helmets to use and all provide life jackets. If you decide to take a full day trip or a multi-day trip, almost all outfitters provide meals and camping equipment. Some even have lodges or cabins! The best part about all of these trips, is the bonding time you’ll experience together. 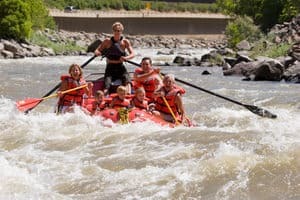 Rock Gardens Rafting in Glenwood Springs Colorado has a white water rafting adventures for all ages and abilities! Enjoy a mellow family float on the Colorado River or Roaring Fork Rivers, or a whitewater adrenaline trip on Glenwood Canyon’s Shoshone Rapids. They have half-day, full day, and customizable trips available. After beating the rapids, unwind in the world’s largest hot springs, the Glenwood Spring’s Colorado Hot Springs Pool. It was voted the #1 place in America to cool off by the Travel Channel. At night, get some shut eye at Glenwood Canyon Resort. They have a great selection of lodging, with modern facilities, in a serene and gorgeous setting. For an unforgettable half-day trip, Rafting In The Smokies, Pigeon River Trips are definitely entertaining and fun for the whole family! First, spend a few hours battling class 3+ rapids or floating down the river with your younger kids. Then, venture across a suspended bridge to their very own private island where you can participate in a canopy tour, race your kids on a zip line, or push your toddlers on a swing! The Truckee River has always been a favorite of mine! Spending most summers in Tahoe, my family and I looked forward to its leisurely floats on rafts or even tubes. Truckee River Rafting Company has rafts available for 2-20 people. They also have free shuttles running and offer lifejackets for kids ages 2+. Bring your own lunch (no Styrofoam or glass) or raft to the end and lunch on the patio at the beautiful River Ranch Lodge! In the heart of Colorado is Noah’s Ark Rafting Company on the scenic Arkansas River. Noah’s Ark has 1/2 and full day trips with added excursions if you wish. Raft in the morning and soak in hot springs for the afternoon, or trek with lamas, off-road in Jeeps, or hike and rock climb! They have a lot of experience not only providing quality trips, but with youth groups, ministry adventure trips, and family vacations as well. 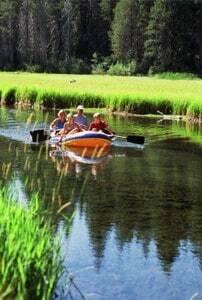 ROW Adventures in Idaho operates on the Salmon River. River Jesters will accompany the guide on multi-day trips. The River Jesters provide games, activities, and explorations for kids while the guides navigate you through the rapids and point out different must-see sights along the river’s edge. 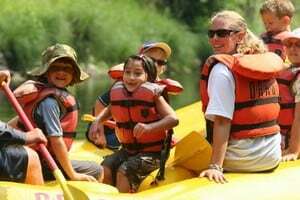 ARTA River Rafting has special 2 day family trips running along the South Fork of the American River. Often times, they’ll designate a “kid raft”, throw an “un-birthday party” or have a “no-talent” show! To keep their menu kid-friendly, they substitute in peanut butter, marshmallows, and pancakes so even picky eaters will enjoy their food. Enjoy a fun-packed adventure with Wildwater Rafting in South Carolina. 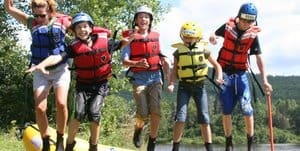 Wildwater’s Chattooga Ridge Adventure Center & River Canopy Tours is one of the wildest and most beautiful whitewater rivers in the country for families with children ages 8 and up. While on multiple day rafting trips, families can sleep in Yurts or cabins with comfortable beds, coffee makers, ceiling fans and more. The adventure center also has kayaking, climbing walls, paddling clinics, and a variety of lodging and food options. Raft down the Grand Canyon with REI Adventure! Fly in an airplane to spend your first night at Bar 10 ranch where you can horseback and be treated to wonderful country hospitality. The following morning you’ll take a helicopter ride into the Canyon. Then you’ll raft over 13 medium-to-low-intensity rapids, hike canyon walls, and explore the desert wonderland before zooming across Lake Mead by boat. The Pirate Adventure by North Woods Rafting is complete with eye patches, swords, a treasure hunt and more! Join the crew and embark on a pirate adventure of a lifetime down the mighty Androscoggin. This trip meets up at their base in Milan, NH, but with only a few dates available, you’ll want to sign up soon! If you love dogs, how about trying a Muddy Paws Sledding & Rafting Trip in New Hampshire. They cleverly combine a half day whitewater rafting trip in the morning with a dog sledding adventure for the second half of the day. Now that’s a combination! Dinosaur Expeditions offers an amazing deal for families where 1 kid ages 8-10 can ride free with one paying adult! They have trips ranging from afternoon adventures to 5 day treks through big canyons and fun rivers, even some through Dinosaur National Monument! If you’re looking at a specific trip, what ages are allowed on that trip? Do they provide meals/snacks/drinks and if so, will they adjust the menu if your child has special dietary needs? Is there extra storage in the raft for the kid’s items (toys, towel, extra clothes, etc)? Great post! Dinosaur Expeditions (Utah) has an amazing Rails and Trails combination trip which includes an easy 11 mile bike ride followed by lunch and a fun rafting adventure. Loved it! A few friends and I are thinking about going on a rafting tour for an upcoming vacation. We want to make sure that this is a good idea and that we are prepared. I like what you said about bringing closed toe shoes for the event.